Disney is already the king of the box office. And if the company's $71.3 billion deal for most of 21st Century Fox goes through, it will add even more big-name franchises — including Deadpool, the X-Men and Avatar — to its roster. The end result: A company with clout unmatched by any other traditional movie maker. This year's box office sales show how formidable the new super-company could be. Thanks to "Black Panther," "Avengers: Infinity War," "Incredibles 2" and "Deadpool 2," Disney (DIS) and Fox (FOXA) together control nearly half of the domestic market share so far in 2018, according to Box Office Mojo. Barton Crockett, a senior analyst at B. Riley FBR, expected that total will fall to about 40% by year's end, since the two studios have already released many of their biggest titles. But even that is a substantial chunk of the market. He said the merger could make Disney the "Walmart of Hollywood." Picture this: a company so large that it can corner the market on blockbusters even more than it already does, while at the same time sweeping up every coveted industry award. A company with sway over theater chains, and a command in the developing streaming market. "They'll have so much share, that it will seem to give them leverage up and down the supply chain," Crockett added. "It's what happens in a world where one studio, mainly Disney, is having outsized success in doubling down on its investments, and most of the other studios seem to be on their heels a bit when it comes to making movies." That kind of control has its perks. For example, Crockett said the new Disney-Fox company would have a stronger hand to play when it negotiates with theaters over the share it keeps of receipts from ticket sales. Disney was already doing well in that regard. The Wall Street Journal reported last year that the company received about 65% of ticket revenue from "Star Wars: The Last Jedi," a number the newspaper characterized as a new high for a Hollywood studio. Studios typically take 55%, according to the Journal. "If they continue to grow their share of domestic box office, it's hard to escape the conclusion that they'd have leverage over time to get an even higher share of movie receipts," Crockett said. Disney declined to comment for this story. But its representatives have publicly defended the studio combination, saying that market share in Hollywood isn't a sure thing. When The New York Times Editorial Board last week questioned the speed at which US antitrust officials approved the Disney-Fox deal, for example, Disney's antitrust counsel fired back. 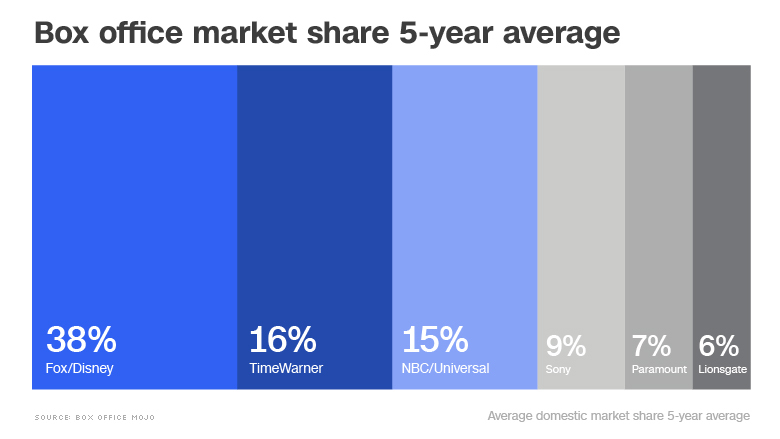 Concerns about market share ignore competition from other studios including Universal, Warner Bros., Paramount, Sony-Columbia, Lionsgate, Netflix and Amazon, wrote Thomas Barnett, who is antitrust counsel to Disney in the deal, in a letter to the editor. Barnett also dismissed the focus on just the last five months at the box office. On average, he wrote, the combined share of Disney and Fox studios has been lower. Historically, that has been true. The two studios controlled about 35% of the domestic box office last year, according to Box Office Mojo. A decade earlier, they held about 27%. But Crockett said the Disney of today is stronger and better built to succeed than the Disney of the past. CEO Bob Iger has built an entertainment empire with Pixar, Star Wars and Marvel, all of which are franchises his company bought within the last 12 years. "It is fair to say that the movie business is fickle. There's a history of people having a hot hand today and then losing it tomorrow," Crockett said. And maybe that's already happening to Disney, he added — "Solo: A Star Wars Story" disappointed when it opened in May. Even if Star Wars falters, though, Crockett said Disney still has Marvel, Pixar and the rest of its library. "I think the safe assumption is that Disney's going to continue to be very successful in domestic box office, and have a dominant share," he added. Buying Fox wouldn't just give Disney more blockbusters. The deal also comes with prestige. Disney would inherit Fox Searchlight, a production and distribution arm of Fox that has been cleaning up at the Academy Awards. The studio had a hand in three of the last five Best Picture winners with "12 Years a Slave," "Birdman" and "The Shape of Water." Disney has dabbled in high-end film making before, said Jeff Bock, senior box office analyst at Exhibitor Relations. But the quality of the adult fare and the level of diversity that Fox offers is on another level. "These films have sent shock waves throughout the industry. They are lasting. They are evergreen," Bock added. "They'll have something really incredible. And you just hope that it stays autonomous enough that the Mouse House doesn't mess up what Fox already has going on." 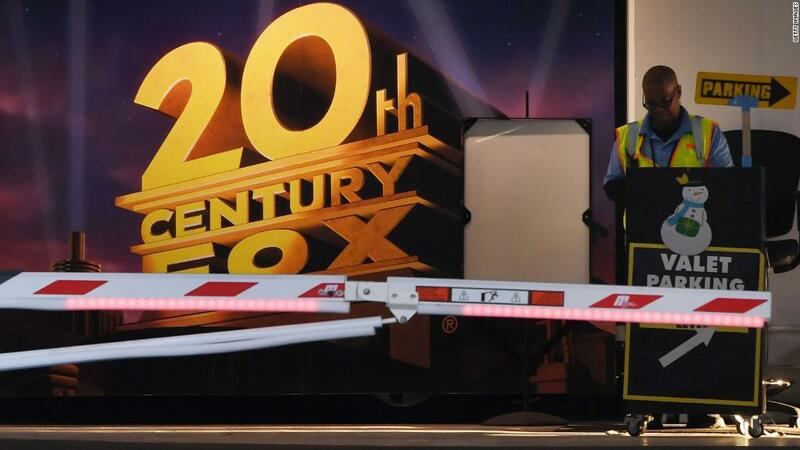 Iger has said he's not interested in changing Fox Searchlight. During the company's annual shareholders meeting in March, the Disney CEO said he every intention of maintaining the studio's business. Fox Searchlight's "The Shape of Water" was nominated for 13 Academy Awards and won four, including Best Picture. But there are other questions about what the new "super-studio" would look like, Bock said, including how many movies it would produce. He added that Disney doesn't have a ton of movies on its release schedule already. And those that it does put out are primarily blockbusters. "If a major studio suddenly disappears, that's a huge concern for theater owners," Bock said. Local theater owners see volume as a potential issue, too. "I have some trepidations about what a Fox/Disney merger might mean to smaller operators like myself," said Lee Akin, the co-owner of a few theaters in Iowa and Wisconsin. "I am mostly concerned that the number of movies doesn't shrink down." Box office might is only part of the equation. As other legacy media companies have done this year, Disney and Fox are motivated to join forces as a way to take on tech giants like Netflix and Amazon (AMZN). Those companies are turning the entertainment industry on its head. Netflix (NFLX) alone is estimated to be spending as much as $13 billion this year on shows, according to a report in The Economist. Apple (AAPL) has Hollywood hopes, too, signing deals with Oprah Winfrey, Reese Witherspoon and Steven Spielberg. That kind of competition might have been on the minds of the antitrust authorities who green lit the Disney-Fox deal two weeks ago, said Jonathan Barnett, a law professor at the University of Southern California Gould School of Law. "The agency might have reasonably come to the determination that today, theatrical exhibition is just one part of a broader video content market," he said. Declining attendance at movie theaters, for example, suggests that at least some people are substituting a trip to the box office with a night on the couch. If streaming video is considered part of the same market that theatrical releases are, Barnett said, a company like Disney would have less control. The concern about concentration "would be substantially diminished," he added. Akin, the local theater owner, also pointed to the power of digital newcomers as an issue. "I would welcome some larger players to compete against the streaming services which I think are the real companies to watch out for in the future," he said, adding that Disney and Fox together would be able to "drive the future of the business to a larger extent than the other studios." The National Association of Theater Owners, an industry trade group, has also suggested Disney could act as bulwark for traditional moviegoing. "Disney is the strongest protector of the theatrical window," the group's president and CEO, John Fithian, told The Hollywood Reporter in April, noting that Disney is also working on its own streaming service as a Netflix competitor. In any case, Bock, the box office analyst, said the deal could portend changes in Hollywood. "There's one studio that's above, and then the rest are fighting for scraps," he said, adding that some competitors might want to team up. "It's going to be an 'us vs. them' sort of thing." But Bock also said he hopes the merger could lead to more creativity elsewhere in the marketplace, once studios realize they can't compete against a Disney production that costs $200 million or more to make. He pointed to Paramount, the Viacom (VIA)-owned studio that has long been struggling. Its latest film, "A Quiet Place," was a surprise hit when it debuted in April. The film made $187 million in the United States and cost only $17 million to produce, according to Box Office Mojo. "It's going to take a turn to inventiveness, I think, for these other studios," Bock added. "Maybe that will be great for film making."